To celebrate their new project The Galvanizers, arts hub SWG3 invited Local Heroes to develop a dynamic and progressive design project at 100 Eastvale Place in Glasgow’s west end. SLAPS designed the Glasgow-Rella and the Calm Tree for SWG3 after four months of user-research and regular observation around Glasgow outdoor spaces. This is the question posed by design curator and founder of Local Heroes, Stacey Hunter. Galvanize! is a Local Heroes project creating an opportunity for designers to consider The Galvanizer’s outdoor space in the context of shelter, shade and seating with a vision that is exuberant and captivating. 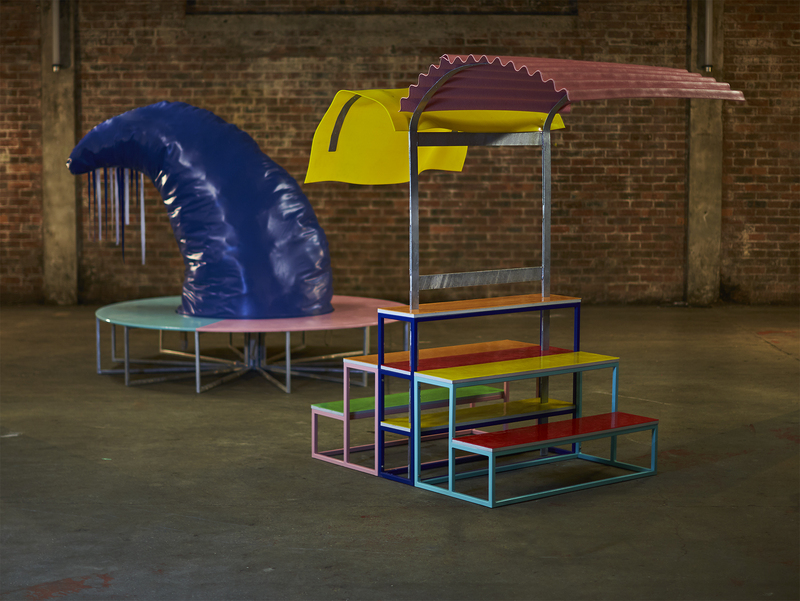 ‍Local Heroes commissioned design duo SLAPS (Giulia Fiorista and Ed White) to respond to designing for open spaces in the Scottish climate with exciting, unique and expressive propositions. The Glasgow-Rella and Calm-Tree were unveiled on June 30th at the launch of Hypermarket. SLAPS are a young experience design studio based in Glasgow who specialise in the physical realm of product and service design and focus on how a service or experience feels for the people who interact with it. The brief is wide-open: in a large outdoor events space, design unknown objects that can also be used as furniture. Constructed using materials like galvanized steel and plastic – these exuberant design objects punctuate the open space with bursts of colour. 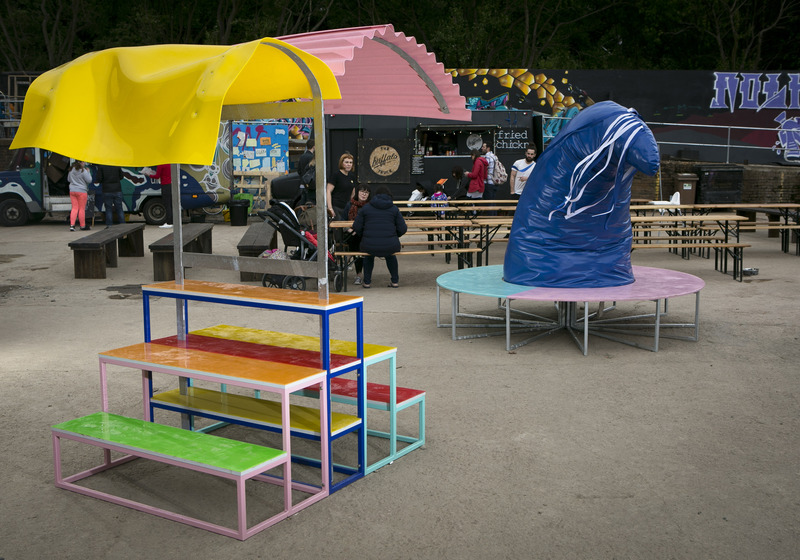 Fabricated by Glasgow’s newest fabrication workshop Alien & Daughters the pieces are suitable for sitting, eating and drinking and are intended to withstand the Scottish weather with ease. With Local Heroes, Stacey Hunter joins Turner Prize winning sculptor Martin Boyce and art curator Patricia Fleming who have all been invited by SWG3 to catalyse The Galvanizers extending the arts venue’s exhibition and events programme. Generously funded by Creative Scotland and Scottish Enterprise, the first exhibits from Local Heroes will coincide with the design and food themed Hypermarket events throughout the summer of 2017. The starting point for ‘Galvanize!’ is an essay by Paul Goldberger (Design Research, 2010) proposing that the dream of modern design made available to everyone has broadly come true — from Ikea to IPhones, never before have more people been able to enjoy modern design. The consequence of design moving to the centre however, is that space for creativity in design has been reduced — what was once radical is now commonplace. Local Heroes responds with Galvanize! offering the design team creative freedom and encourages an experimental approach that embraces the avant-garde, the unpredictable and the playful. Local Heroes is a cultural project which works to promote Scottish design at home and internationally and SWG3’s expansion is an exciting place to present new ideas about the role of design in everyday life to large and diverse audiences. Located in Glasgow’s West End, SWG3 houses design studios, a gallery, club nights, and mini-festivals and is home to a community of over 120 creatives. We are delighted to present these radical new designs to the public this summer. We asked Local Heroes to commission fun, bright interventions into our new outdoor exhibition and events space and are delighted that SWG3 can continue to be a test bed for exciting new cultural projects like Galvanize! The SWG3 public programme is generously funded by Creative Scotland and Scottish Enterprise. 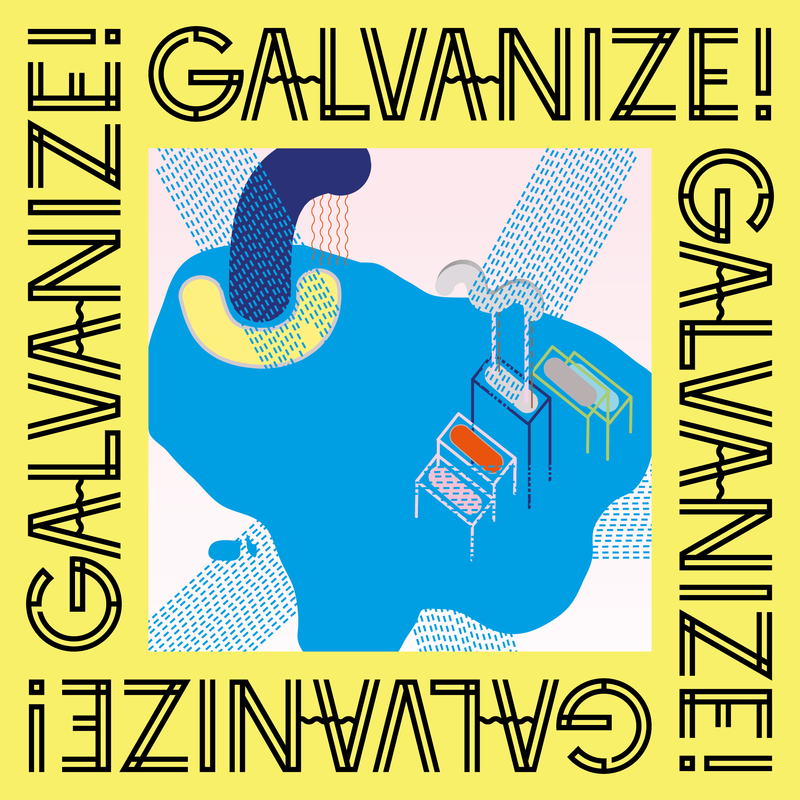 Creative Scotland is proud to be supporting the inaugural event, Galvanize! from the curators of Local Heroes, for SWG3’s public programme in their newly created outdoor space Yardworks. 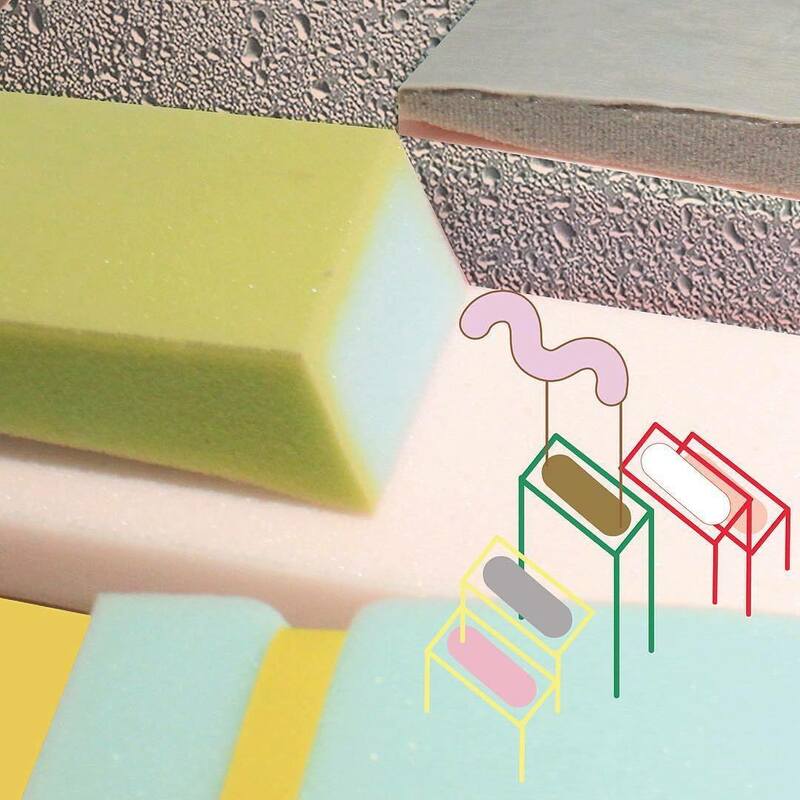 This project encourages local, and international designers, to work together to develop new bold, daring, poetic and confronting installations to populate this new creative space for the city of Glasgow. We are very excited to part of this project, which will engage the public with the latest in contemporary Scottish and international design from artists and creatives of the highest quality.